As world population pushes towards nine billion by mid-century and millions are elevated to the global middle class every year, demand for water continues to grow as well. More people need more water for drinking and household use, but also for agriculture, mining, energy, and industry. With water often cited as a limit to growth and potential crisis point, the World Resources Institute has released the Aqueduct Water Risk Atlas, which details various types of water stress around the world in impressively detailed fashion. Unlike many other similar risk indexes, the atlas allows you to see the variability of risks within a country to a high degree of granularity. This helps highlight the vastly varied degrees of stress in countries like China and India and also shows the localized stress urbanization can place on water resources. Japan has relatively low overall water risk, for example, but Tokyo faces high risk. 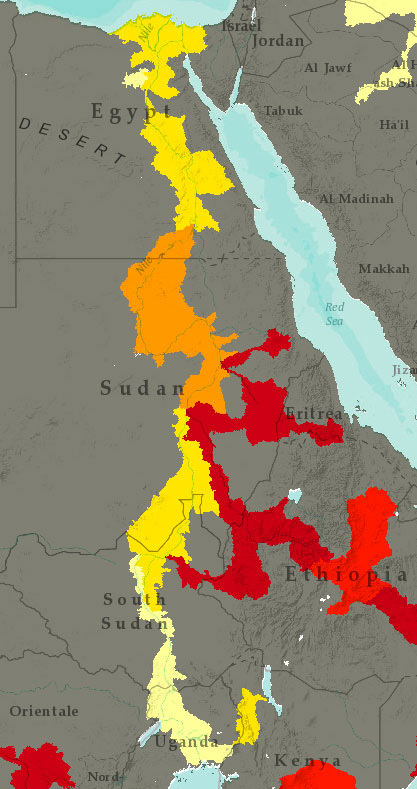 What’s striking is a near continuous band of extremely high water scarcity risk stretching from North Africa through the Middle East, South and Central Asia, and northern China. 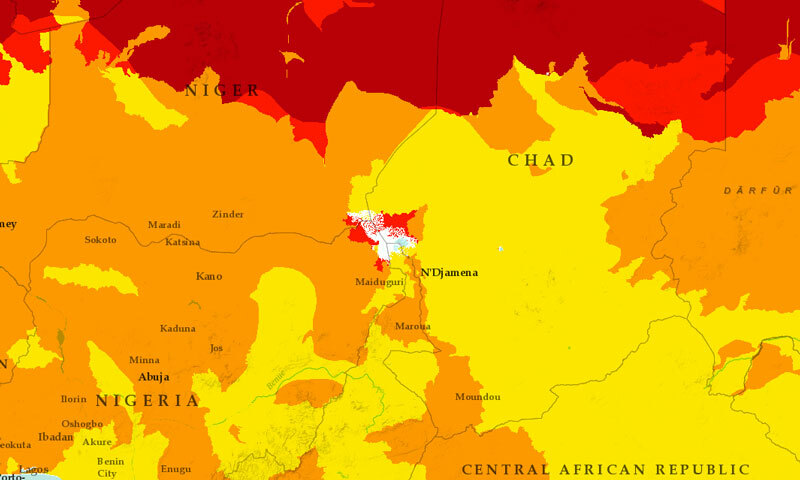 Shrinking Lake Chad is visible as a ring of scarcity in central Africa. As the lake dries up, desert is left behind, increasing the water stress for those living on the lake’s edge. Another filter shows there’s high risk of poor water quality in the Middle East, India, northern China, and much of the United States, via a calculation of the water has been used upstream and the number of protected areas around rivers and watersheds. Sufficient infrastructure can mitigate that risk in some places, like the United States, but in others, like India, infrastructure is less robust. Some risk factors are unsurprising – Southeast Asia has a well-documented history of flooding, for example. But others are challenge expectations, like the relatively low history of drought for famously dry countries like Yemen and Mongolia. The Water Risk Atlas breaks down hydrological vulnerability into a number of variables, including the potential for high-risk events like droughts and floods and also projected future access through groundwater levels and the potential for upstream storage. The map does not include specific indicators linked to climate vulnerability, a factor which will certainly significantly impact water availability around the world. However, in many cases, regions which are currently experiencing high degrees of water stress will likely experienced increased stress in the future, so it’s possible to extrapolate some estimation of future climate-related stress from the data provided. Regions which have experienced droughts and floods in the past could be prone to similar events of greater severity in the future, like recent droughts in the Horn of Africa and Midwestern United States, for example. But including a measure which accounts for changing weather patterns could be useful, if difficult to calculate. One way to mitigate the severity of droughts and floods is to build dams, which can regulate river flow and store water to be released in times of need. The atlas includes a layer that shows the upstream storage potential for major rivers. Heavily-dammed Brazil, for example, has little remaining potential storage, while parts of Africa and Central Asia have much more potential. Of course even in areas that are geographically favorable, when a river cross international boundaries, political factors can play a major role in dam construction. The Nile River, for example, has medium to high storage capacity but dam building there has been especially fraught with political challenges. Upstream countries like Ethiopia want to harness the river both for water storage and electricity generation, but downstream countries, most notably Egypt, want to limit or prohibit construction entirely. The fact that current sharing agreements are based in part on colonial-era treaties complicates the matter even further. Many of the risk factors noted in the atlas are natural, like the seasonal variability of rainfall, but others, like access to clean water and sanitation, are man-made. The good news is that in many places lacking improved water sources and sanitation, like sub-Saharan Africa (excluding the Sahel and the Horn of Africa), there is a relatively low risk of other indicators like baseline water stress and drought, demonstrating that access to clean water and sanitation has more to do with the availability of infrastructure than quantity of water, at least in this context. In providing a deeply information-rich and visually appealing way to navigate the large number of stresses on the world’s water, the Water Risk Atlas both highlights a growing problem and provides a tool to help navigate these risks in years to come. Sources: BBC, International Rivers, U.S. Drought Monitor. 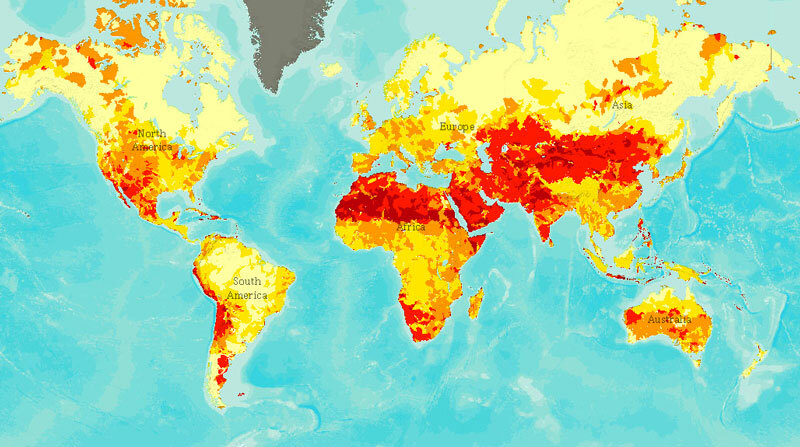 Image Credit: Aqueduct Water Risk Atlas, World Resources Institute.